Acies Bio is a leading European research-driven biotechnology company with more than 10 years track record of developing innovative technology solutions for improving people’s lives and building a sustainable, bio-based future. Their research and development activities are focused on development of disruptive technologies for efficient production of bioactive compounds and providing new solutions for the transition towards a sustainable AgriFood sector. Their approach in development of microbial strains and bioprocesses, based on the combination of the latest cutting-edge synthetic biology techniques and traditional expertise in microbiology and directed evolution, is enabling us to cooperate with top tier international biotech and pharmaceutical companies. 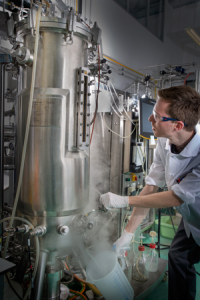 Acies Bio operates in Ljubljana Brdo Technology Park (Slovenia) and has state of the art laboratory equipment for strain development, optimization of fermentation processes from lab to pilot scale as well as isolation and further chemical derivatization of natural products. Acies Bio will be involved in key tasks of Work Package “Probiotics and Struvites” (WP1) (leader of Task T1.3) and Work Package “Fertiliser Optimisation” (WP4) of the SUSFERT project where it will further improve the actinobacterial probiotic strains and develop corresponding bioprocesses for industrial biofertiliser production. To enable sustainable and economical biomass generation, as well as production of fermentation-based siderophore, in Work Package “Siderophore Production” (WP3) Acies Bio will evaluate the possibility of using side streams from food industry as key media ingredients. Another important role of Acies Bio will be in bringing the natural potential of iron and phosphorus solubilizing microbial strains towards commercially relevant biofertiliser(s), most likely in partnership with a large (bio)fertiliser producer.